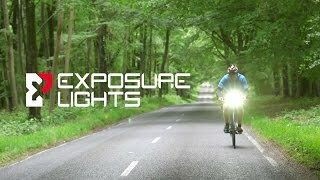 The Exposure Trace DayBright Front and Rear Light Pack is a super compact front light with a powerful output and hassle free USB recharging. The Trace features Optimum Mode Selector, offering 3 brightness modes and the choice of solid or pulsing beams. The Trace also has Fuel Gauge displaying the remaining battery life using a traffic light system to make it clear when it's time to recharge. Excellent side visibility will make sure you're safe and seen out on the ride. There are now more cars on the road than ever and modern motoring life is full of distractions – radio, satellite navigation, and hands free mobile phones to name a few… 80% of all traffic accidents involving cyclists occur during the daytime (source: ROSPA 2014). The new DayBright pulse pattern is designed to cut through the distractions of busy roads and visual noise in modern motoring and is visible from over a kilometre away, even in the brightest of sunlight.